While the details vary depending on the design, the installation of a textile facade (a.k.a. tensile membrane facade) requires planning and expertise. An experienced design-build specialty contractor, such as Tension Structures, understands the importance of keeping you well-informed about the installation implications of the design decisions prior to final approval. 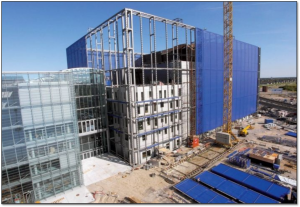 However, as the textile facade installation date approaches and your overall construction project unfolds, it’s important to keep these important considerations in mind. Regardless of whether your textile facade design calls for customized field assembly or modular pre-tensioned panels, your construction site layout needs to include a designated area for the unloading and staging of the facade materials and installation equipment. Ideally, the staging area will be close to the actual installation site, as this helps to streamline the process. As your date approaches, your project manager will remind you of the space requirements for the staging area. Some designs will need minimal square footage, while others require substantial space to partially assemble elements of the facade. 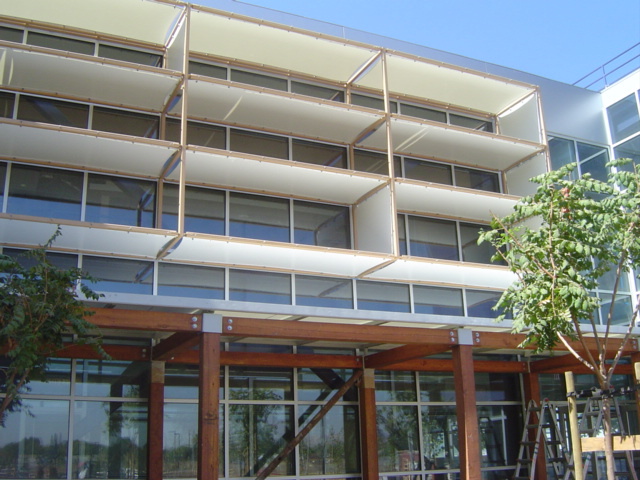 While not relevant for all designs, some textile facades call for components to be hoisted into place, such as projects that have fused large expanses of membrane panels prior to installation. 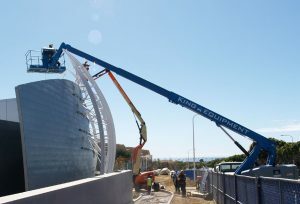 Small jobs can use hand-cranked Genie lifts, and bigger projects may require construction fork lifts. 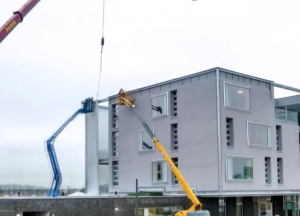 In the event of limited access, a crane may need to be brought onsite for the installation. As the design and engineering phases of your project get finalized, your project manager will discuss any special equipment that would be required for the installation process. The installation plan will include the use of construction equipment to give the team of certified installers access to building’s envelope. Scissor lifts work well for easy to reach vertical areas, while standard boom lifts provide the ability to reach diagonally. Articulating “knuckle” booms may be used for hard to reach places and scaffolding can be used when there’s no access for equipment. As the installation plan is being developed, your project manager will work with you to understand the limitations of your construction site in order to address any challenges and ensure the proper equipment will be available. Is a Textile Facade Right for Your Project?